Users can set up methods of notification (IM or Email), scheduled checking and it will automatically alert targeted recipients if criteria is met. Alert scanning engine can only run on the server where your database is located. 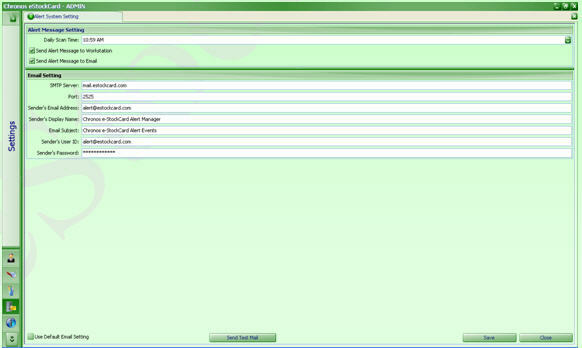 Step 2 Choose the row where name = “Chronos eStockCard3 Alert Service”. Make sure Status = Started. You must configure alert scanning engine if you wish to reap benefits from Alert module. Additionally, you may have to seek advice from your IT administrator since this will involve configuring your organization’s e-mail server. There main screen consists of two parts which must be configured properly. In this section, you have to specify which email broadcaster that you wish to use. 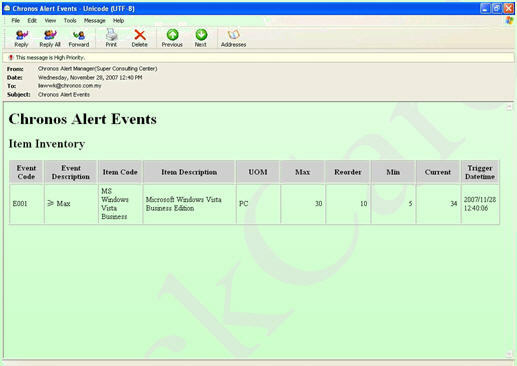 e-StockCard scanning engine will send alert messages to email broadcaster and the later will broadcast to targeted recipients. 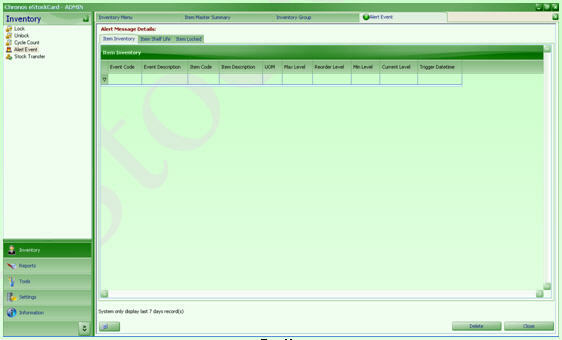 In summary, e-StockCard scanning engine will NOT broadcast directly. You may have to consult your IT administrator to configure this part properly. 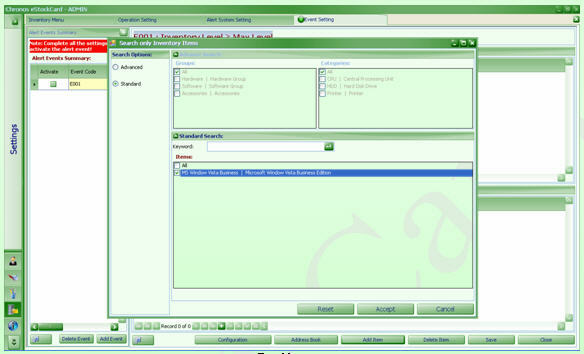 The current setting and configuration belongs to Chronos Consulting Center. For info: – once all the info have been set, the users can click on Send Test Mail to check whether the email alert can be send or not. If the email can be received, then the setting is done correctly otherwise please re-check back on the settings. 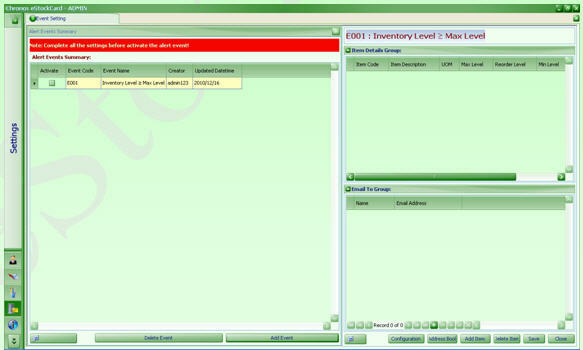 In this section, you will learn to how configure an event so that it can be processed and monitor by scanning engine. Once it is configured, system will scan and monitor it daily and report the abnormality, if any. Item code “MS Windows Vista Business” has 14 copies in warehouse which is exceeded maximum level. (Max level can be set at Settings > Item > Master). You can verify this by launching Reports > Inventory > Inventory Summary – By Qty (Fig. 5) . Step 5 Select “MS Windows Vista Business” from items drop down and click “Accept” You have successfully assigned item code = “MS Windows Vista Business” to event E001. Step 6 If you wish to receive any alert message through email, click “Configuration” and tick “Send Alert Message to Email”. 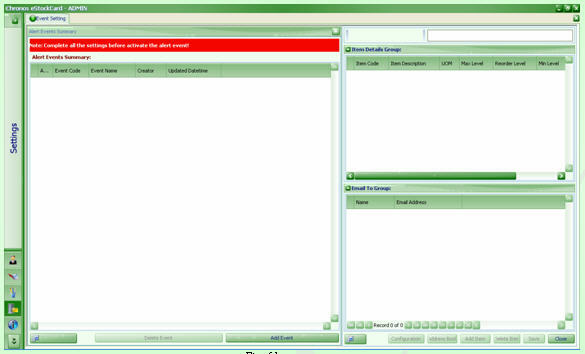 Step 7 Specify email addresses who are the recipients of alert messages. Add, Edit or delete email address will be performed under “Email To Group” sub-screen. Click “ + ” to add email address, Click “ √ ” to save the email address. 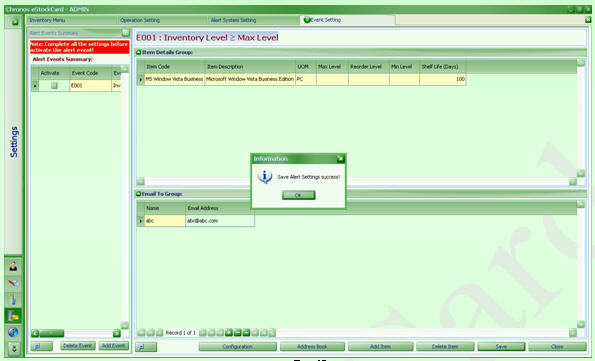 Alert message was fired by Alert Scanning Engine and alert you that the current inventory holding for MS Windows Vista Business is exceeded max level. You must take proper action to stop to pile up your inventory. Private: After purchasing the Chronos eStockCard Inventory Software via electronic payment gateway, what should I do next?